The red and roe deer are the only native species in the wild in the UK. Fallow deer are now acknowledged as part of our natural heritage. Each differ in their geographic distribution, abundance, population growth rate, behavior, and impacts. The red deer is Britain’s largest native land mammal with adult stags weighing up to 190 kg and are up to around 140 cm at the shoulder. Red deer are herding animals and woodland creatures with a close association with open areas. They will sometimes spend their time almost exclusively in the open. They rut/mate in the autumn and usually produce single calves in the spring. In large numbers they can be very damaging to woodland habitats, farm crops, trees and gardens. The roe deer is a land animal of mixed and small woodland but is capable of adapting to a wide variety of habitats. It has colonized the northern conifer forests and has penetrated many towns and made use of gardens, parks and other open spaces where there is food and cover. It has also been seen in open farmland. In large numbers they can be very damaging to woodland habitats, farm crops, trees and gardens. Fallow deer are considered as a naturalized species. They are a land and herding animal that has exhibited extreme flexibility in most aspects of their social organization, with group size influenced by both habitat and season. 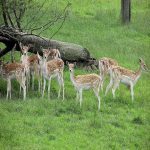 Fallow deer live within a range of habitats such as commercial conifer plantations to large open agricultural areas with small woodlands. They are primarily grazers but they take a variety of vegetation and from the inhabited areas and may when in large numbers cause considerable damage to woodland and forestry or farm crops, trees and gardens. Diet: Many ornamental plants, fruits and vegetables. 1) Shoots, flower buds and foliage stripped off plants, with the damage often occurring overnight. 2) Damaged woody stems often have a ragged cut end where a deer has bitten part way through the stem and then tugged the shoot off. 1) Shooting: Although permissible to apply control by shooting, this generally not safe to so and in a legal manner concerning gardens. 2) Netting and fencing: The most effective and humane way of prevention. Netting needs to be robust and relatively tall to prevent squeezing through and high enough to prevent them from jumping over. 3) Animal deterrent sprays based on aluminum ammonium sulfate with frequent application in spring and summer.